I must advise that I am an independent publisher, and the opinions and review below are my own. The links in this review are affiliate links, and I will be paid financial compensation if you purchase though these links. But, as I enjoy using these audios and have benefited from it, I have no issue with highly recommending these audios to anyone. Do you struggle with trying to change your thoughts or behaviour? Do you want to find an easier way of using hypnosis to create change in your subconscious? Would you like to find a way of using hypnosis in just 20 minutes a day? The, ‘Think Right Now’ audio’s are designed to help re-program your subconscious in a such a way, to make change more easier and effortless for you. By using a certain script, they are designed for your subconscious to accept the script more effectively. The company have a catalogue of products, from increasing confidence, to reducing anxiety. I have bought the laser focused concentration as well as the reduce panic and anxiety CD’s, and will therefore be reviewing these. From the concentration CD, the obvious benefit is that you become more confident after listening to the CD, and likewise with the reduce panic and anxiety CD. The benefits are to help you with your issues by just listening to the CD which takes about 20 minutes. Becoming more effective at being focused helps you become more productive, and reducing anxiety allows you to become more confident in you ability to produce results and achieve your goals. 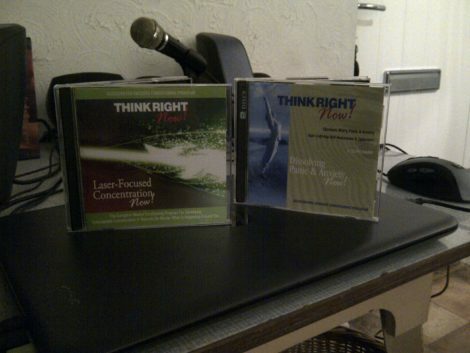 The think right now CD comes with just a CD and a CD cover. Depending on what you purchase, there may be just CD’s or an instruction manual or even a download. As the products are audio CD’s, you would need to have a CD player or a PC/laptop/DVD player to be able to use he products, as well as a comfortable place to lie or sit down, like a chair or bed. While not essential, headphones are also recommended. If you purchased a download, you just require headphones or speakers to listen tot the audio. Quite simply, just play the audio CD to listen to the session, and sit back and relax. You can do this on a bed or in a comfortable chair. If you wish, you can use them with your eyes open (like I’ve done) while you do household chores. As long as you are able to hear correctly and you have no hearing impairment, you should be able to use this, as this is an audio program. Great question. I have used the reduce panic now CD and the laser concentration CD, and I have been in situations where I could’ve panicked and lost my focus. I have found that my relaxed nature and my focus has improved, although as to how much, I am (at this stage) unable to tell. All I can say, is that I have found benefit after just one session of each, although that is enough to convince me that I have had goo results from this programme. It must also be stated that I haven’t used headphone with mine, and have done household chores and juggling when it was played on my speakers. You may have faster results if you used headphones, although at this stage I cannot determine this. It also goes without saying that you require some good quality headphones or speakers to make this work, but these are affordable, and shouldn’t get in the way for success. As long as you give it a week (minimum) you should get noticeable results. I say noticeable, as you probably will get results straight away after using for one session. Like anything with hypnosis, the more you do, then better you will be, so be patient. Like I said earlier on, I have done this for a week, and I have some small but noticeable changes have happened since then. I am more focused, and feel a bit more relaxed at home. OK, you do need to take 20 minutes to do one session, and while 20 minutes isn’t a lot, to some people, that is more than they can sacrifice. However, if you can find a way to grab hold of 20 minutes spare time, then this will be worth the effort. Also, you do have to be relaxed, which isn’t easy if you have a racing mind, so try taking up some mindfulness mediation to get you to calm down first so that you are receptive to the suggestions. For more information on the, ‘Think Right Now’ products, please click here.